Apple Fritters are another one of my childhood food memories. 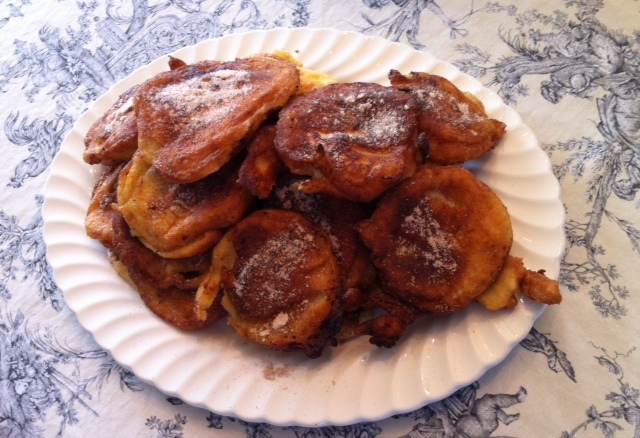 On a late Fall or early winter morning, my mother would treat us with these fritters. Rarely did we eat food that lacked in nutrition, making these extra special! What could be better for breakfast than sweet apples fried in a luscious light batter topped with cinnamon sugar? That’s right, NOTHING! She was very health conscious. She drained them on paper towels. Then we would douse them in cinnamon sugar. Cinnamon is very healing. Yes, that’s my defense! The trick with apple fritters is to use soft apples like Macintosh apples. They cook up very quickly. Hard apples would take too long, in this recipe, and the batter would probably burn. If you only have a harder apple like a Granny Smith, I would dice them and put a handful into the batter and spoon this into the hot oil. It’s not the same, but will still be tasty. The biggest trick to frying food is to make sure the oil is hot enough. It sounds obvious, but I’ve often tried to rush the process when the oil wasn’t at the right temperature. Foods will cook in warm oil, but they will not become crisp and golden. Your food will absorb less oil if the oil is hot. Separate the whites from the yolks of the eggs into two bowls. Add to the yolks, the sugar, salt, flour and milk. 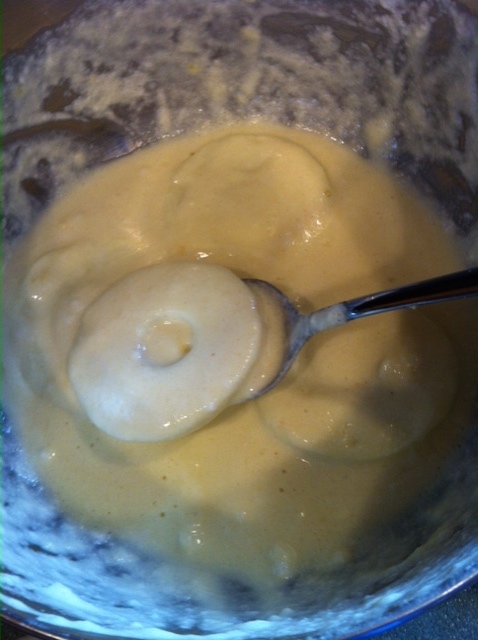 Mix until the batter is of a light pancake consistency. Beat the egg whites until they form stiff peaks. Fold the egg whites into the batter. Peel and core apples. 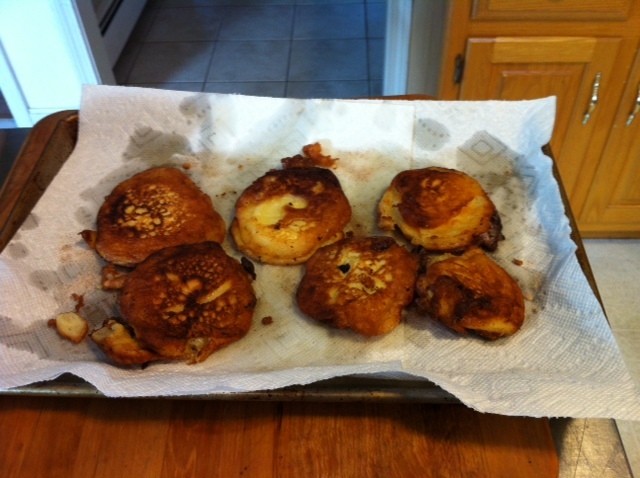 Slice the apples into the shape of donuts (hole in the middle) and dip a few at a time into the batter. The apple slices should be somewhat thin, maybe about ¼ inch thick. My mother always used an electric frying pan for these. Heat the pan at 360 to 380 degrees and add enough Crisco to deep fry the apples. I would suggest about ½ inch of oil. You will have to add some more Crisco after one or two batches. If the oil looks like it’s getting too hot and browning, add some more Crisco to cool it a little. I don’t use an electric frying pan. I don’t even own one. I use a skillet on the stove stop. I use a thermometer to make sure the oil is the right temperature. It’s usually at a medium-high heat. If you’re not sure, try putting one coated apple slices in the oil. It should bubble and hiss in the oil. It doesn’t take long for these to cook. You just want them golden. I put about 4 or 5 apple slices in at once to cook. Don’t walk away! They cook quickly. I use a long carving fork to turn them over in the oil. You can use two knifes or a spatula. 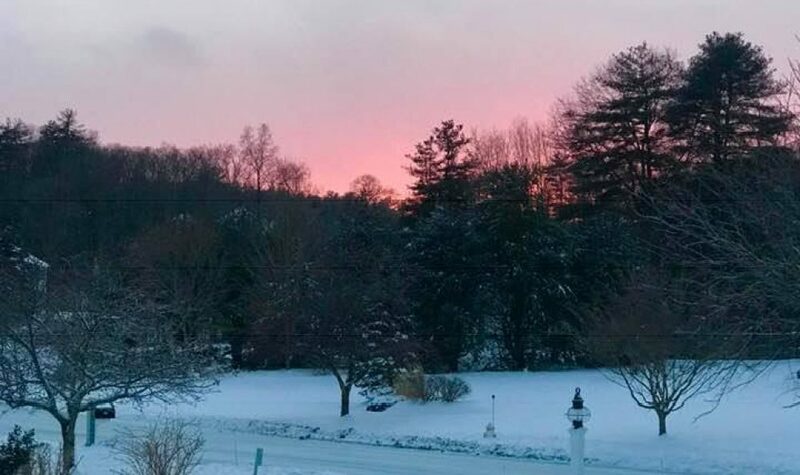 Whatever you feel works for you. Here’s a tip when cooking with hot oil, when you’re turning food over in, turn the food away from you, like towards to back of the stove. You don’t want hot oil to splash you, but the stovetop can be easily cleaned. You know it’s time to turn them when the sides have browned. 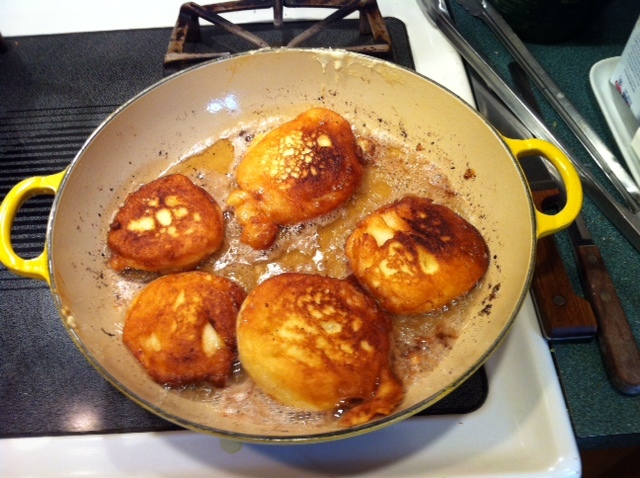 I lift the cooked fritters out the pan with a slotted spoon, so oil can drain away. Place the fritters on a paper towel lined cookie sheet. This helps absorb some of the extra oil. Then I sprinkle the hot fritters with cinnamon sugar. These fritters are fabulous hot or cold. Note: Please discard the oil after you cook the fritters. I let it cool in the pan, and then pour into a heatproof container like a glass measuring cup. I either freeze or refrigerate the oil so that it hardens. Then I toss it in the trash in its hardened state. Do not pour the oil down your drain, unless you want to call a plumber. This will clog it for sure!